Cinnamic acid is an organic compound with the formula C6H5CH=CHCOOH. 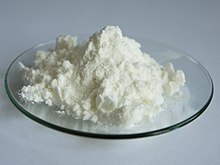 It is a white crystalline compound that is slightly soluble in water, and freely soluble in many organic solvents. Classified as an unsaturated carboxylic acid, it occurs naturally in a number of plants. It exists as both a cis and a trans isomer, although the latter is more common. Cinnamic acid is a central intermediate in the biosynthesis of myriad natural products include lignols (precursors to lignin and lignocellulose), flavonoids, isoflavonoids, coumarins, aurones, stilbenes, catechin, and phenylpropanoids. Its biosynthesis is performed by action of the enzyme phenylalanine ammonia-lyase (PAL) on phenylalanine. It is obtained from oil of cinnamon, or from balsams such as storax. It is also found in shea butter. Cinnamic acid has a honey-like odor; it and its more volatile ethyl ester (ethyl cinnamate) are flavor components in the essential oil of cinnamon, in which related cinnamaldehyde is the major constituent. The original synthesis of cinnamic acid involves the Perkin reaction, which entails the base-catalysed condensation of acetic anhydride and benzaldehyde. Rainer Ludwig Claisen (1851–1930) described the synthesis of cinnamate esters by the reaction of benzaldehyde and esters. The reaction is known as the aldol condensation (with accompanying hydrolysis of the anhydride). It can also be prepared from cinnamaldehyde and benzal chloride. Another way of preparing cinnamic acid is by the Knövenaegel–Hans condensation reaction. The reactants for this are the corresponding benzaldehyde and malonic acid in the presence of a weak base, followed by acid hydrolysis. Cinnamic acid is used in flavorings, synthetic indigo, and certain pharmaceuticals. A major use is in the manufacturing of the methyl, ethyl, and benzyl esters for the perfume industry. Cinnamic acid is a precursor to the sweetener aspartame via enzyme-catalysed amination to phenylalanine. Cinnamic acid can dimerize in non-polar solvents resulting in different linear free energy relationships. ^ "Cinnamic Acid" . Encyclopædia Britannica. 6 (11th ed.). 1911. p. 376. ^ Vogt, T. (2010). "Phenylpropanoid Biosynthesis". Molecular Plant: 2–20. doi:10.1093/mp/ssp106. ^ Claisen, L. (1890). "Zur Darstellung der Zimmtsäure und ihrer Homologen" [On the preparation of cinnamic acid and its homologues]. Berichte der deutschen chemischen Gesellschaft. 23: 976–978. ^ Tieze, L. (1988). Reactions and Synthesis in the Organic Chemistry Laboratory. Mill Vall, CA. p. 1988. ^ Bradley, J.-C.; Abraham, M. H.; Acree, W. E.; Lang, A.; Beck, S. N.; Bulger, D. A.; Clark, E. A.; Condron, L. N.; Costa, S. T.; Curtin, E. M.; Kurtu, S. B.; Mangir, M. I.; McBride, M. J. (2015). "Determination of Abraham model solute descriptors for the monomeric and dimeric forms of trans-cinnamic acid using measured solubilities from the Open Notebook Science Challenge". Chemistry Central Journal. 9: 11. doi:10.1186/s13065-015-0080-9. PMC 4369286. PMID 25798191. This page was last edited on 16 August 2018, at 13:24 (UTC).